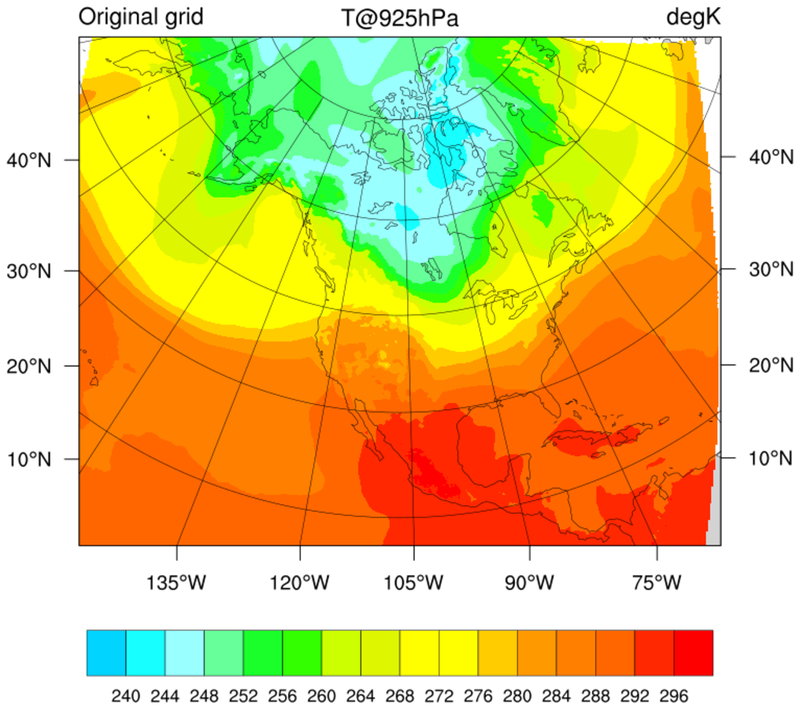 The NCEP North American Regional Reanalysis (NARR) products are on a Lambert conformal conic grid (32km) at 29 pressure levels. They were produced using Eta 32km/45-layer model. 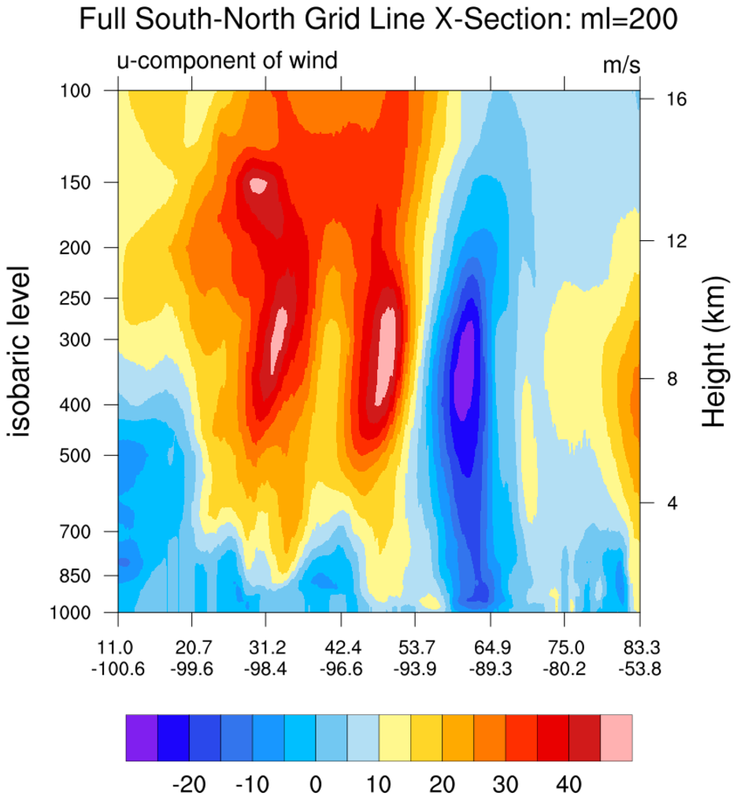 The input data includes all observations used in NCEP/NCAR Global Reanalysis project, and additional precipitation data, TOVS-1B radiances, profiler data, land surface and moisture data, etc. The output analyses are 3-hourly with additional 9 variables in the 3-hour forecasts to reflect accumulations or averages. 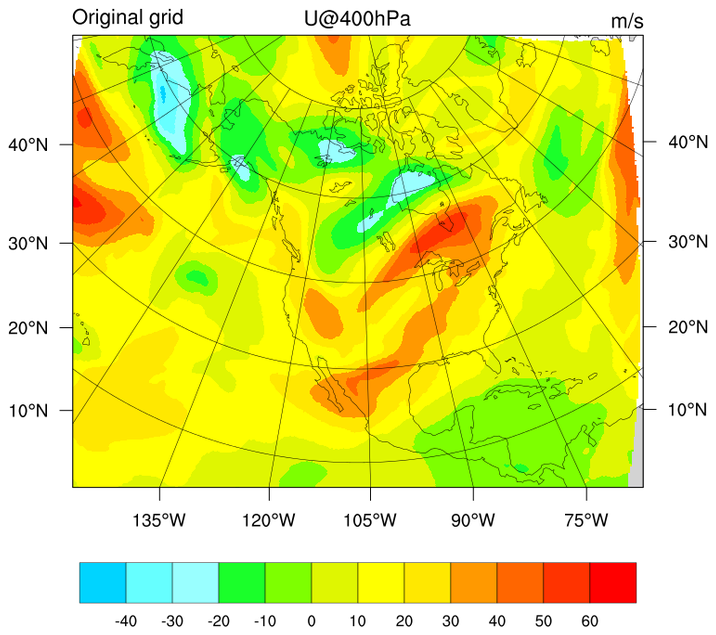 NARR data is distributed on a native lambert conformal grid with 2D latitudes and longitudes. For a description of native lambert conformal grids and how to plot them accurately in NCL, click here, or refer to any of the examples below. 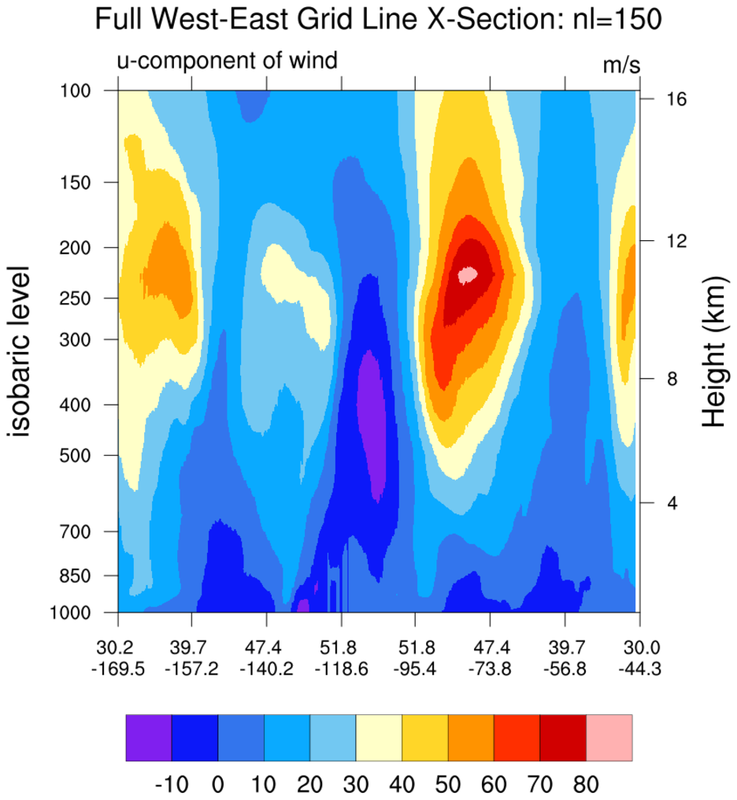 NARR data is available from NCAR's Research Data Archive in GRIB format, a subset of NARR data is also available from NOAA's Earth Systems Research Laboratory (formerly, the Climate Diagnostics Center [CDC]) in netCDF format. See Example 2. Important note: in the corners of the images on this page, you may notice some small slivers of missing data. 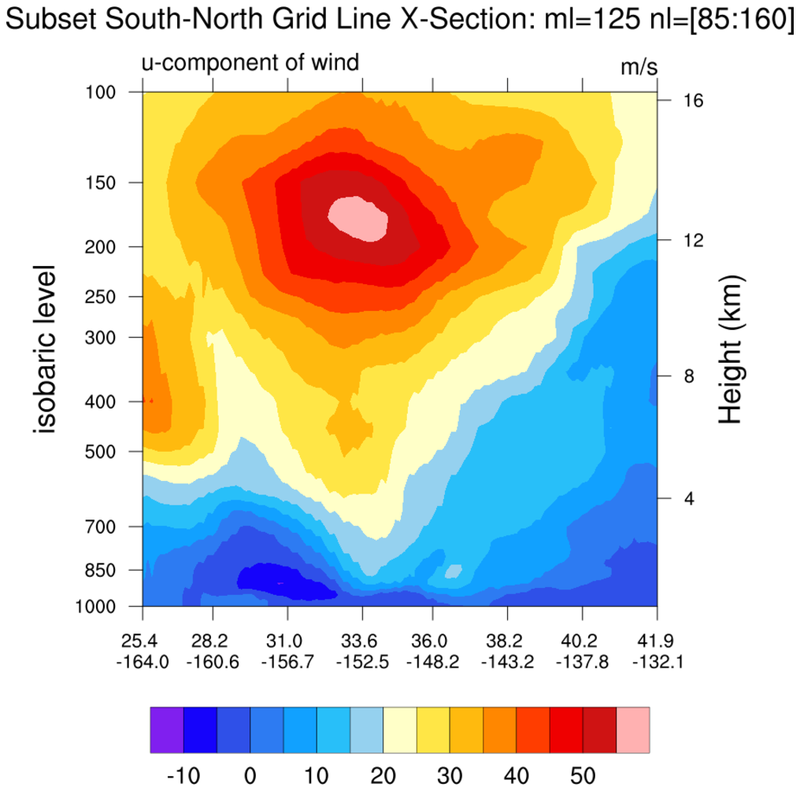 The original NARR Eta-12 model grid is regridded to standard NCEP grid 221 for public distribution, Lambert conformal conic, which you see here. narr_1.ncl: This script demonstrates how to quickly read a NARR GRIB file into NCL, and shows how to plot the data on the NARR native grid. 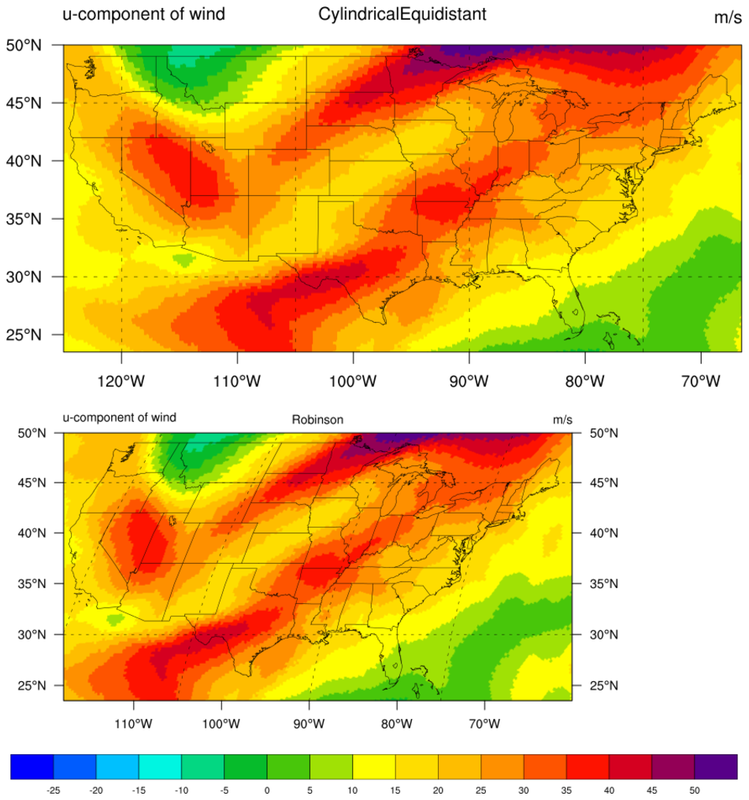 The file used in the example was obtained from NCAR's Research Data Archive. Note that NCL can read GRIB files directly. In addition, NCL provides additional information [eg, geographical coordinates] that are not on the original GRIB formatted file. The ncl_filedump utility can be used to view any GRIB [nc, hdf-sds, hdf-eos] file as seen via NCL. narr_2.ncl: This script demonstrates how to read in a NARR netCDF file into NCL. In this case, the data is stored as 16-bit integers (referred to as type "short"). In general, data of type short must be transformed prior to calculations and plotting . The contributed function short2flt may be used to directly read the data. Note that short2flt will automatically apply the add_offset and scale_factor attributes during the conversion from short to float. 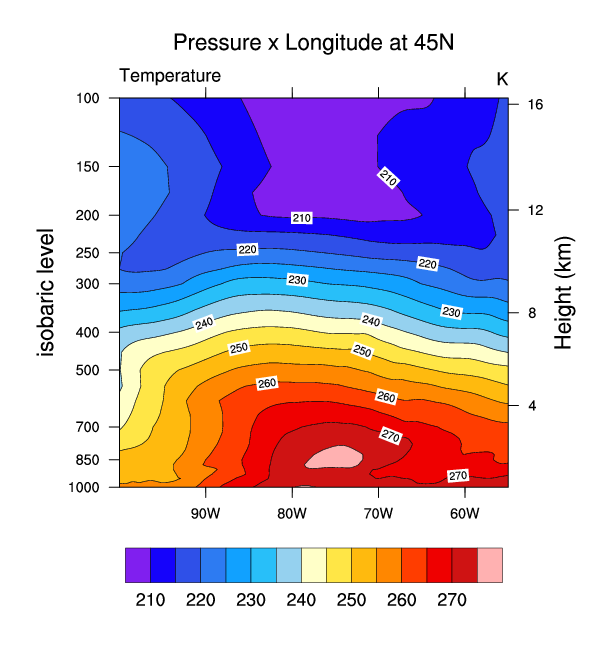 NOTE: Some of the NARR files from NOAA/PSD contain a _FillValue attribute that differs from the missing_value attribute. This problem has been reported. If the values look bad, add the following fix suggested by David Allured. narr_3.ncl: This script uses the triple2grid function to place values from the NARR Lambert Conformal grid on a 2 degree by 2 degree grid. Note that no interpolation is done here! The original grid is plotted in the top panel, while the regridded data is shown in the bottom panel. The sample script outputs a netCDF file containing the interpolated 2x2 grid. An ncl_filedump of the netCDF file is here. narr_4.ncl: This script uses the same files used in Example 1. The data are on a Lambert Conformal projection. 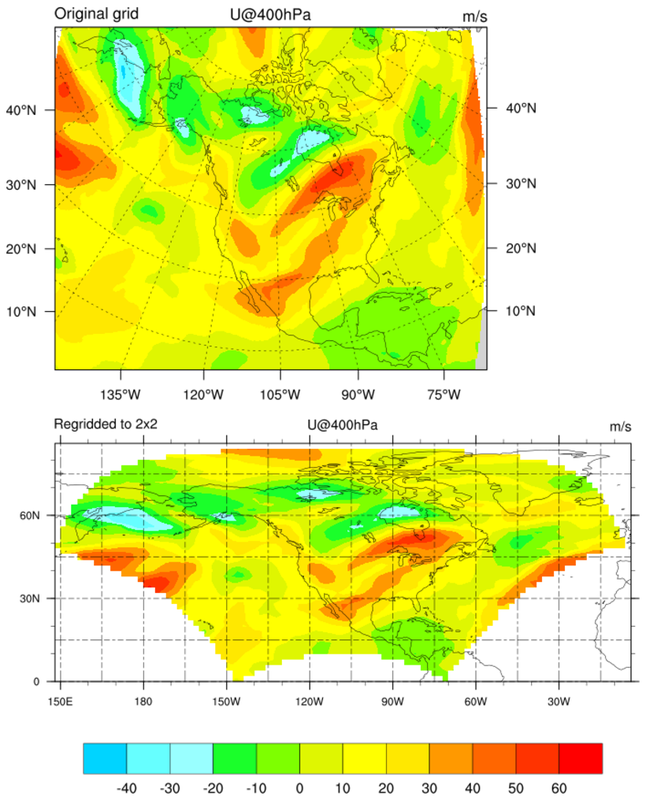 The narr_4.ncl script plots the region of the lower 48 United States using two different map projections: Cylindrical Equidistant and Robinson. Further, the mpLimitMode= "LatLon" is used to manually set the appropriate limits for each projection. narr_5.ncl: This script uses an ESMF generated weight file (see ESMF example 30) to efficiently regrid a source NARR curvilinear grid to a rectilinear grid. 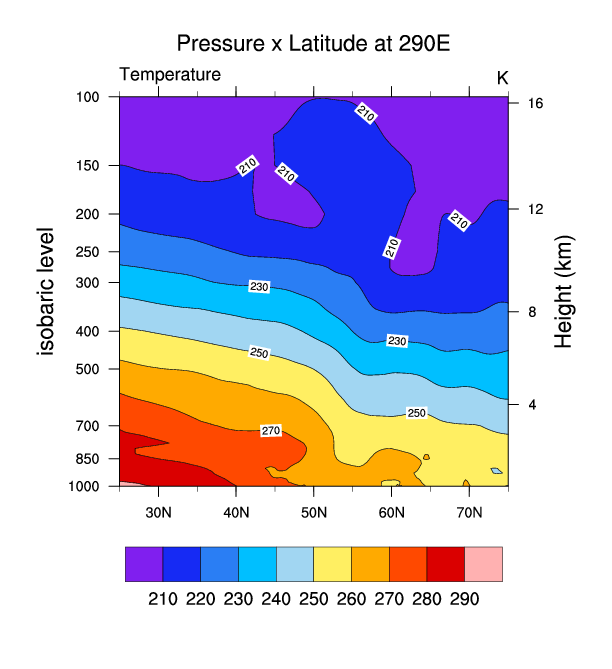 Then three cross sections are plotted: (a) pressure x longitude; (b) pressure x latitude; and, (c) pressure x user_specfiied_set_of_points. For this example the user specified latitude/longitude locations lie along a great circle path between two user specified locations (see gc_latlon). They could be latitude/longitude locations along a (say) cold front. ESMF example 30 was run twice: bilinear and conservative interpolation. Bilinear interpolation would generally be appropriate for any reasonably smooth variable. Conservation interpolation would be recommended for interpolating flux quantities and variables that can be fractal (eg precipitation). narr_6.ncl: The NARR grid is curvilinear. This means that the grid point locations require two-dimensional latitude and longitude arrays. 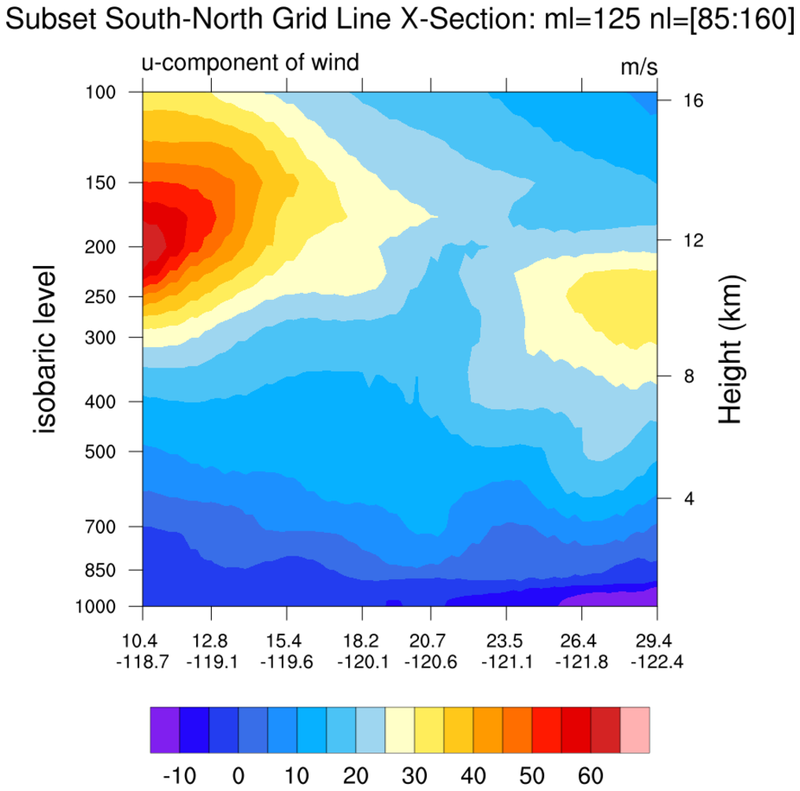 The leftmost figure shows the north, south, west and east boundaries (black outline); selected east-west grid lines (blue); selected north-south grid lines (red); and, user specified subsets of grid lines. Sample 'grid line following' cross sections are created. 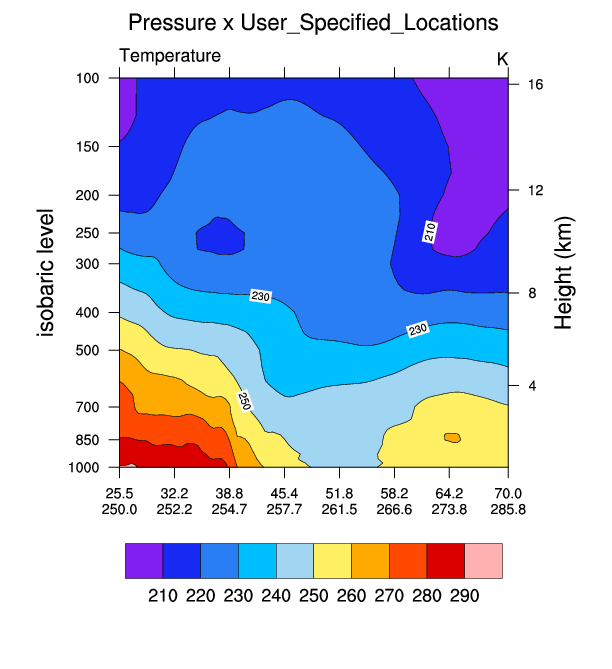 narr_7.ncl: ncl-talk question: How can I interpolate NARR data to particular points in space at specific heights (lat_pt, lon_pt, height)? This example creates a function to perform the necessary tasks: (i) vertical interpolation to specified height levels; (ii) interpolate from a NARR curvilinear grid to a rectilinear grid; and (iii) use linint2_points_Wrap to interpolate to specified locations. xcoord :	(-135.3, 157.2)   <===      "          "